Forget about new parent overwhelm with these 11 helpful breastfeeding trackers. Being a new parent comes with a huge learning curve, right? And there’s so much to remember – how often your little one feeds, how many wet and dirty diapers, which breast you nursed with last and so much more!! It can get so overwhelming. And you can double that overwhelm if you have twins!! So a simple breastfeeding tracker can make your new mom life much easier. I’ve rounded up 11 of the best breastfeeding trackers so you can concentrate on bonding with your new baby. What is a Breastfeeding Tracker? A breastfeeding tracker is where you record all the information about your breastfeeding sessions. The information you collect with your breastfeeding tracker can help you with your first postpartum doctor visit as well as help you figure you the right feeding schedule for your baby. There are several types of breastfeeding trackers so do spend a little time finding one that’s right for you – otherwise you’ll get stressed out about using it. A tracker is supposed to make life easier – not more stressful! As a new parent I’m sure your plate is full enough – you’re still trying to master breastfeeding, recover from childbirth, AND get baby to sleep through the night. Do you really need ONE more thing to do? Here are several reasons why you need a breastfeeding tracker in your new mom life. A breastfeeding tracker actually helps reduce new mom overwhelm. Because you aren’t trying to remember how many wet diapers your baby had yesterday or how many times baby nursed in the night. This is especially true during that intense first week at home with your new baby. So the less you have to remember, the easier it is. Want to get the lowdown on what the first week at home with a new baby – or two! – is really like? Check out this honest post. Keeping accurate records actually makes it easier to talk to your doctor about any concerns you have about baby. Because you have evidence – not just a vague worry about a change in feeding you think might have happened. 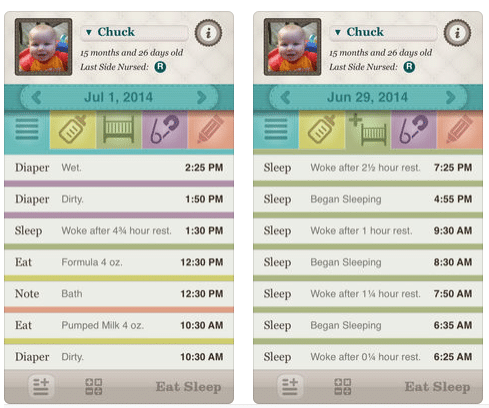 A breastfeeding tracker will help if your baby is not gaining enough weight. Is my baby feeding enough? All new moms worry about this. And a breastfeeding tracker will give your doctor the information they need to support you and baby. Here’s a helpful chart to help you see how your little one is doing. If you have any concerns talk to your appropriate medical professional. Low milk supply is a real thing for new moms and you can track that easily with your breastfeeding information. As the weeks go by, you’ll be able to build a routine around some predictable feeding times. Just be aware that babies change their routines as they grow and develop so any routine should be flexible! You might also want to track which breast you nursed on – so you remember to start on the other breast next time – frequent and full draining of each breast regularly is essential for keeping up your milk supply. That really depends on you and baby! But it’s a good idea to track breastfeeding until you get to know baby’s routines so you can recognize any change. And it’s always a good idea to track breastfeeding if baby is struggling to put on weight – you doctor will be able to give you more advice about what and how to track if weight gain is an issue. Remember that you can always go back to tracking your breastfeeding if you start to have any concerns. 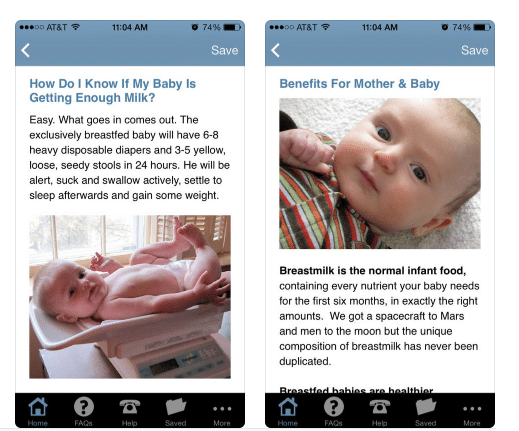 This is a free breastfeeding app from the makers of Medela breast pumps. 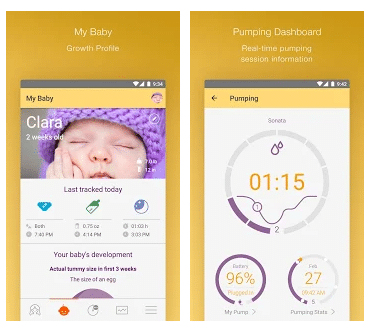 This app helps you easily track breastfeeding, pumping as well as sleep, diapers and weight. I love the daily stats feature – you can easily see baby’s activities for the day on one page. Essential for exhausted mamas!! 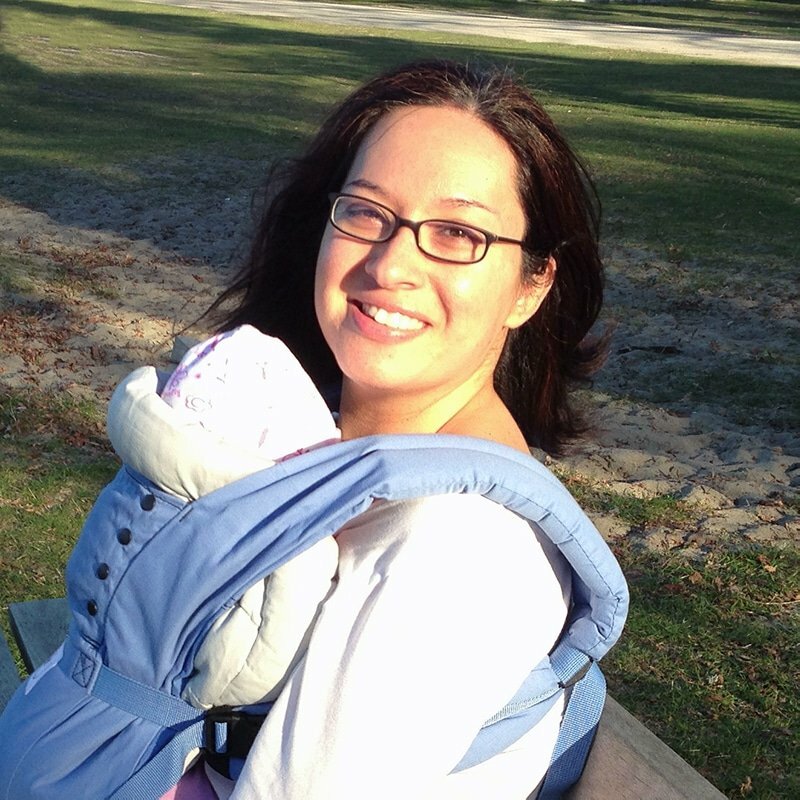 This breastfeeding tracker was created by a board certified lactation consultant. And, as you’d expect, it provides an impressive range of information covering things like the early days at home and returning to work. This app looks simple and easy to use. And it seems easy to navigate the helpful information – perfect for when you want answers to your questions. If you want a no-frills, basic breastfeeding tracker, this one is your new BFF!! Yes, it’s basic. But when you’re sleep deprived and suffering with mom brain, simple is best. 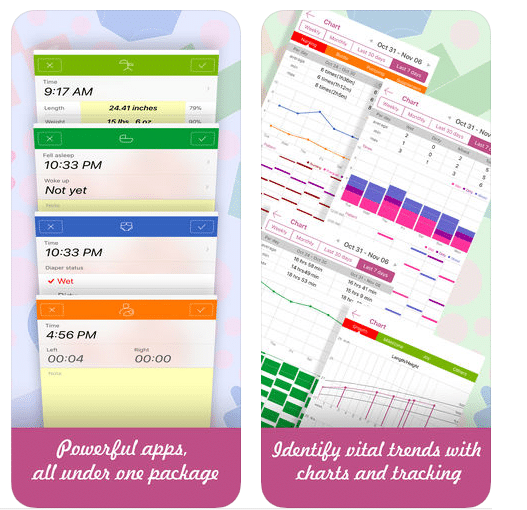 And if you’re sceptical about using an app to track breastfeeding, this is a good one to try – Mackenzie from Mother Tucker swears by it! You can try this Baby Tracker app for free but there is a paid version that gives you access to more information and charts. If you prefer pen and paper here are a selection of helpful breastfeeding trackers to help you keep track of everything. This tracker is so simple to use AND it includes a section to track when you supplement with formula. If you supplement with donor milk like I did, you could use this section to track how much donor milk you used. Again, this tracker lets you track feeding and diapers. Just add baby’s name, date and your important contact info. This one would be perfect if you’re tracking information for a doctor. This cute and colorful tracker from Mommy’s Bundle has a space to track baby’s mood after feeding. So you could add if baby is fussy or happy….or asleep! Think you’re too tired to use a tracker? Kristin from Apple Cart Lane has made tracking so easy! And she’s a graphic designer so you know this tracker is going to be beautiful! I LOVE bullet journals. 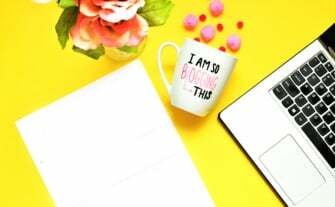 They’ve helped me get my mom and blogger life organized. 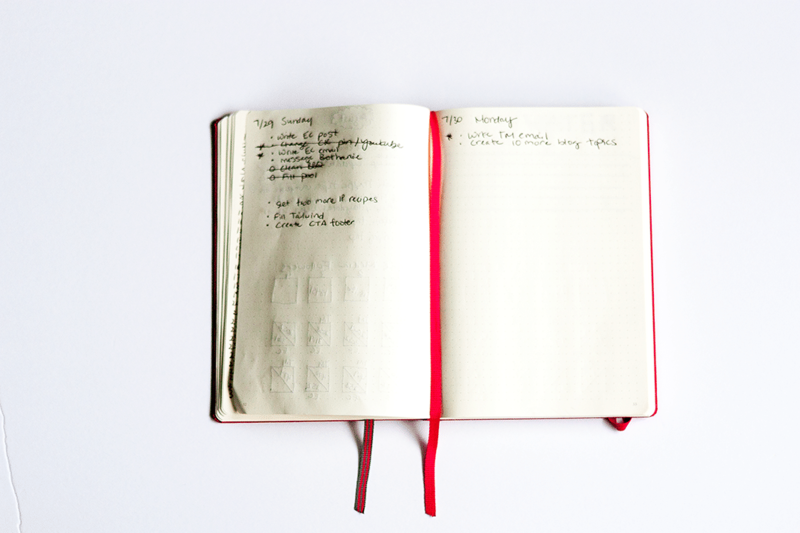 But did you know you can also use a bullet journal to track your breastfeeding sessions? The awesome thing about using a bullet journal to track baby’s stats is that it’s completely customizable. And all you need to get started is a bullet journal and a pen. The Leuchtturm bullet journal is one of the most popular. And it comes in a range of colors. This is the Bullet Journal I have. And this set of 10 colorful pens will make bullet journaling fun. This 90-page journal lets you track your breastfeeding for 3 months. Perfect to kick off your breastfeeding journey! I love this one because it’s spiral bound – so easy to use! If you’ve got twins, you could color code the feeds for each or use the first letter of their name. I just had to include this one! Look how pretty that cover is!! And it’s so easy to track feeding, sleep and baby’s immunizations. Phew!! Can you say ‘lifesaver’! A breastfeeding tracker can make new parent life so much easier – and with so much choice, you’re bound to find one that’s right for you. And remember, mama, it’s ok to swap breastfeeding trackers if the one you chose doesn’t work out for you!! Over to you – tell me in the comments how do you track your breastfeeding sessions. Do you have any pro tips for making tracking breastfeeding easier? Don’t forget to pin me for later.